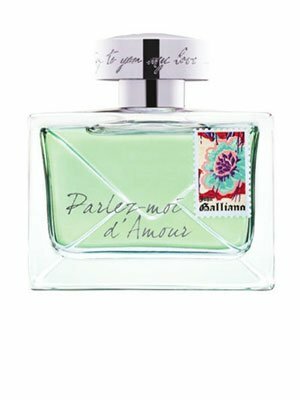 John Galliano Parlez-Moi d?Amour is launched in mid October 2010. The eagerly awaited second perfume is romantically named after Edith Piaf?s song Parlez-Moi d'Amour or ?Speak to me about love?.Parlez-Moi d'Amour is build on Galliano?s principles of emphasized extravagance and femininity, with the ambition to create a modern musky scent that will represent a remarkable contrast to the classical chypre perfume structures and norms. The traditional component of chypre perfumes, the oak moss, has been replaced by the cypress absolute, concentrated in ambery dry-down notes. Its sharp woody accents blended with musk offer contemporary and very modern base notes.This composition full of contrasts opens with fresh overdose of bright ginger, blueberries and bergamot. The perfume heart represents a true ode to love, made from the most seductive floral pair - Sambac jasmine and Turkish rose, while the mysterious and woody base features cypress, Indonesian patchouli and musk notes. The perfumer Alienor Messenet from IFF managed to deliver a glamorous and rebellious youthful fragrance that tells a story of love. Parlez-Moi d'Amour is a fruity, sweet, spicy, romantic and edgy at the same time. If you have any questions about this product by John Galliano, contact us by completing and submitting the form below. If you are looking for a specif part number, please include it with your message.